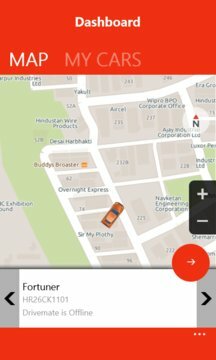 DriveMate: Car Security is an advanced OBD app which talks to your purchased MapmyIndia DriveMate OBD device (http://mapmyindia.com/drivemate/) and is designed for your car's optimal security and tracking. Gone are the days when the whereabouts of your car and the people in it were a constant concern. DriveMate: Car Security is real time gps vehicle tracking system. 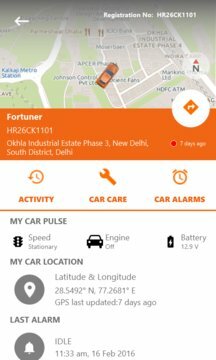 DriveMate: Car Security activates as soon as MapmyIndia’s DriveMate OBD device is plugged into your car's OBD port, allowing you to track your car. It lets you know where your family is. Notify when your car insurance is due. Warns you if your car is being misused by your driver. Alerts you when your car is due for the upcoming service. DriveMate sends all the above notification via SMS and Email on your smartphone. All this with no cutting of the car’s wires making it totally Plug & Play. DriveMate: Car Security is an advanced car gps tracking system which comes with amazing features listed below. Total distance covered during the drive. Total duration of the drive. Start and End gps location of the car with the time of the drive. DriveMate also shows your car’s full history for the day with an option to replay the complete day's movements. Find your Car: Get directions on the map from your current location to your car’s last know location. MapmyIndia now brings gps tracking system on your phone. Unplugged Alert: If DriveMate’s OBD device is unplugged, the mobile app gives a visual change of screen to notify and the device sends a SMS and an Email. Geo-fence Alert: On entry & exit in the marked areas, the app sends a SMS and an Email. Engine on & off Alert: You are notified when ignition is switched on & off. Speeding Alert: Get an alert when your vehicle crosses the speed limit set by you. Insurance Due: Based on the Insurance details entered in the mobile app, alerts are generated and you are notified. Service Due: Based on the Service details entered in the mobile app, alerts are generated and notifications are sent on your smartphone. Vehicle tracking is now as easy as “plug and play”. Rest assured and let DriveMate: Car Security worry about your car.